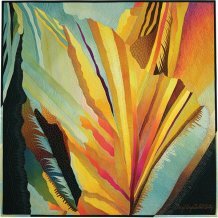 As a textile designer, fiber artist and teacher, Sandy Sciarrotta has been working in textiles for over 35 years, many of those years silk-screening, stenciling and creating yardage for herself and others. 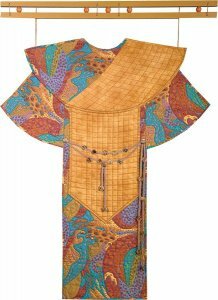 Over the past few years she has created a body of embellished work called 2-Dimensional Kimono Plus, the plus being other inspired one-of-a-kind designs for coats and jackets. Sandy creates the mounting pieces or uses interesting found objects. 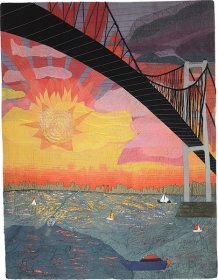 SAQA’s Oregon region is sharing an exhibition of new works interpreting the concept of Bridge, featuring the work of 25 fiber artists from across Oregon. The art is inspired by the broadest concept of Bridge, exploring connections and links, bonds and pathways—both physical and emotional—between people and things. The concept is executed by the artists in both representational and abstract form using a diverse range of fiber techniques. Interpretations of the exhibit concept are driving forces. SAQA is an international non-profit organization dedicated to promoting the art quilt and the artists who create them. Shown above: Anne Daughtry’s quilt, Linking Europe to Asia. Storytelling has existed in all cultures through the ages, beginning with oral stories and pictorial stories on the walls of caves. The Storytellers group was formed because members wanted to continue that tradition by using quilts to present visual stories. Their current exhibit is a challenge to explore stories about cities. Come see their stories! Ken Burns is one of America’s favorite historical documentarians. He is also a passionate antique quilt collector, and has put together an amazing collection. We can’t show you his quilts, but inspired by his passion, we’ll be displaying gorgeous antique quilts from the collections of local quilt collectors. Visit our website for several links to newspaper articles and a documentary about Ken’s quilt collection. Portland quilter Virginia Hammon researched and wrote the upcoming U.S. Money, a book that explains how our money system works, why it needs to change and how to do it. She is illustrating her book with a hundred different quilt blocks, picked for how their names illustrate the text, along with a collection of quilts made with the blocks. At the 2017 Northwest Quilting Expo, she presented thirty of the quilt illustrations, and a small introductory book on money with details of one of the quilts, Wheels of Commerce, based on Willyne Hammerstein’s Passacaglia pattern. Come see the rest of Virginia’s quilts! 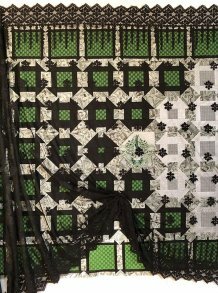 Lift the veil on the Fed—the Federal Reserve, the central bank of the United States—with a quilt (above) named Divorce is an Option using the block called Bride’s Knot 1913 (the year the Federal Reserve Act was passed, also known as Churn Dash). See Trickle Down Economics, a quilt using the Economy block. Touch Pat the Bunny, a textural quilt using the block Blindman’s Fancy, illustrating the impossibility the Fed faces in achieving its goals. It probably goes without saying that our featured instructors are very talented quilters. They’ll bring examples of their best work to share with you. You’ll enjoy seeing a huge variety of wonderful quilts all in one place. Prepare to go home inspired! One of Rosemary Burris’ stunning animal portraits is shown here. Take a class with Rosemary to make one yourself! Here’s what happens when great quilters gather in incredible places—lots of creative and beautiful quilts! You’ll enjoy seeing a variety of interpretations of a single pattern made by happy quilters on retreat. Differences in color, texture, design, balance and more will emerge. 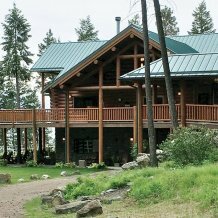 The Northwest is one of the most prolific areas in the country for quilting and quilters. 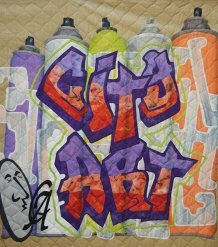 Enjoy the talents of two local quilt artists! 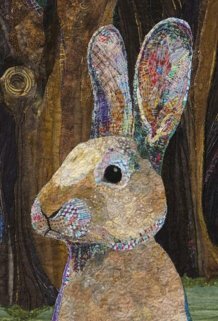 Meticulously designed and beautifully sewn, Evelyn’s and Sandy’s quilts will inspire you and spark your own creativity. Evelyn Bonney’s exhibit is a walk through her journey as a quilter. She began as a traditional quilter with a narrow focus on fabric and pattern choices. But as Evelyn’s talent grew, she tackled a wide variety of steps to achieve her own style, from traditional to contemporary. Evelyn won the Aboriginality contest at The Pine Needle with her outstanding quilt of Australian prints. You will enjoy her journey! Once she retired, Sandy’s passion for quilting took off! Her exhibition of twenty quilts charts a path of everything from beautiful appliqué with awesome fabric selections, to a very traditional yet profound take on the Dear Jane quilt pattern. Sandy has a varied hand and creates beautiful quilts that make her heart—and probably yours—sing!